Hire > 5 x dBadge I.S. The ATEX version of the dBadge2 Noise Dosemeter is approved as intrinsically safe for use in potentially hazardous environments. 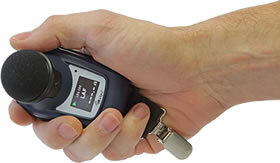 Following a worker round a hazardous environment with a hand-held sound level meter is not likely to be the favoured approach to carrying out a noise risk assessment. 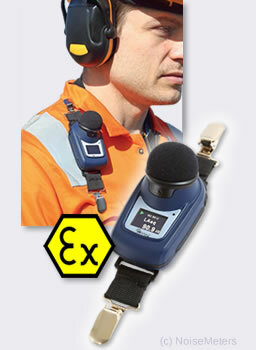 The ATEX approved intrinsically safe dBadge kit includes five dosemeters, so you can monitor the noise exposure of five workers at the same time, without the need to make manual measurements. The dBadge Noise Dosemeter is designed to measure a worker's noise exposure in line with the EU regulations and the HSE guidelines. This ATEX approved (intrinsically safe) version of the Casella dBadge is for use in hazardous and potentially explosive atmospheres. Use the Calibrator that is included and check the dosemeter function. This is a requirement of the regulations. At the end of the working day the measurement can be stopped. It is better to measure for the full shift so that the dBadge can calculate the exposure level, or LEP,d.